This Rome-based gore black metal band was formed in 2012. It issued Promo 2012.Comatose Music signed the band and issued Resurrection Deniedin 2014. The new Devangelic album Phlegethon will be out on 27.10.2017 through Comatose Music. Stillborn issued the band’s Deprecating The Scriptures EP in 2015. Marco Coghe joined in 2016. The new Devangelic album Phlegethon was out on 27.10.2017 through Comatose Music. 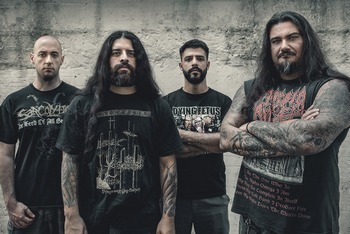 Italy-based death metal band Devangelic signed with The Flaming Arts booking and management agency in 2018. The company also worked with Behemoth, I Am Morbid, Marduk, etc. Obscuring Europe 2018 was the monicker for the European tour of Devangelic, Antropofagus and Relics Of Humanity that September. Italy-based Devangelic would play at PartySan Metal Open Air Festival 2019 which was to take place in Schlotheim, Germany in August 2019. Belphegor, Satan, Testament, Legion Of The Damned, Deicide and others were also confirmed.